Nachla Law Office provides Corporate/Commercial legal services to individuals, small and medium-sized businesses. Corporate/Commercial legal services are FLAT FEE SERVICES. We provide many corporate/commercial legal services in addition to the ones listed here and on our full web site. Please call/email us today for a full list of our services, and to receive our Corporate/Commercial FLAT FEE SHEET. Thinking of Incorporating your small business, and do not know how to go about it? Related to Incorporation of your Business, we make sure that we set up your new corporation so that you will not run into legal problems in the future. We handle all aspects of your incorporation, from your name search and reserving your chosen business name for you, to obtaining your Minute Book and Seal. We will even file your Form 1 to the Ministry of Government Services for you. 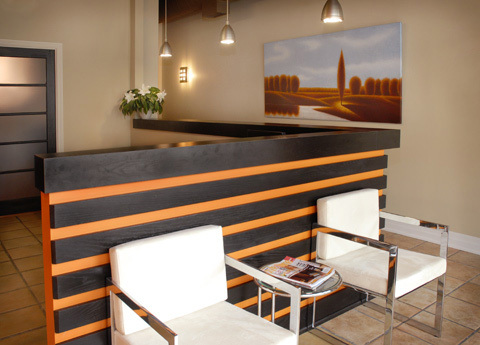 This is a picture of our reception area at 242 Kerr Street, Oakville.